The war for the survival of Man begins! Contamination picks up where Orientation leaves off. Varik and his cult of Eventuals are making their way by sea to the Commorancy in an attempt to breach the walls, kill Marcus and destroy the Commorancy forever. With his father in tow, Varik hopes to use the elder’s awoken powers to harness the remaining inhabitants of the settlement and destroy the Commorancy and Marcus from the inside out. As Marcus (1) continues to lead the guests of the Rooms through the Commorancy and out to the mainland to escape the onslaught Marcus (2) is left behind to deal with the hordes of Lethargic and the invading Eventuals in an attempt to save his home. What ensues can only be described as an all-out war. While some questions from Orientation are answered, there are just as many that are raised as the Guests set out on their journey away from the only home many of them have known for centuries. As the book progresses we learn just how vast and well-fortified Marcus’ masterpiece really is, but we also learn the terrible secret of how it was constructed. On a personal note, since I am a huge “Titanic” buff, I particularly liked the nod to the White Star line in the “See the Sea” chapter. Kirstie and Letje’s histories are explored a little more in depth and for those familiar with the later “Arcene” series, we see the initial introduction of a couple of key characters here as well. There is one “reveal” in particular that was particularly shocking. The fact several other books are grounded and based in this particular world, for me, adds an additional depth of this series that I doubt I would have picked up on had I read them sooner. 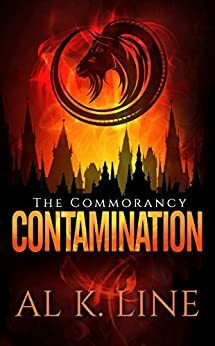 True to the style of Orientation, Contamination also ends with a bit of a shocker that will have you clamoring to read the next book in the series – Evacuation.